Engraving has long been an art form in countries around the world, but finding a comprehensive collection of books on famous engravers and their impact on the artistic medium has been difficult until now. Primrose Hill Press joyfully documents this beautiful, detailed form of art with a vast and varied selection of books on wood engraving, bookplates, and the artists from generations past and present that pioneered this form of expression and creativity. From vivid, picturesque depictions of nature and architecture to engraved prints of animals, our selection of engraving books (including fine press) catalog this art style in many forms. Dive into wood engraving today and see for yourself the beauty of engraving. By W E Butler. An essay on the profound influence of Thomas Bewick, wood engraver and designer, on a rising generation of Russian wood engravers at the turn of the twentieth century. Numerous illustrations together with a list of Russian artists influenced by Bewick. Paperback, 22 pp. By Diana Bloomfield. London and New Castle: Primrose Hill Press and Oak Knoll Press, 1998. Twenty-six engravings and an autobiographical essay by this leading British engraver. Engravings selected by the artist as the best and more representative of her work throughout a career of great distinction. The book also includes a list of Bloomfield’s principal works and bibliography. A limited edition signed by the author with selected original engravings printed from the block is also available in this catalog. 198 x 129 mm, 48 pp, paperback. By Yvonne Skargon. London: Primrose Hill Press, 2000. 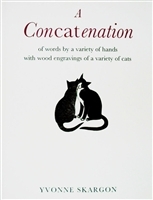 Another international bestseller by Skargon that magically captures our hearts and imaginations in a celebration of felines, this time by linking us with the lives of cats with different personalities, moods and talents across four centuries. Skargon’s earlier bestselling books, also sold by Primrose Hill Press, The Importance of Being Oscar and Lily & Hodge and Dr. Johnson , introduced her own beloved cats to the world. 60pp. Paperback.